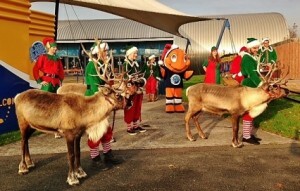 Santa Claus, complete with sleigh, elves and reindeer made a surprise visit to Blue Planet Aquarium, Cheshire Oaks this week. Father Christmas dropped in to meet up with the aquarium cuddly costume character Charlie the Clownfish and finalise details of his official visit there on Sunday, November 30th. The early outing was an unexpected bonus for visitors to the aquarium who had the chance to meet the great man and his trusty team. The team had popped over from the next door Cheshire Reindeer Lodge and Christmas Tree Farm where they will be entertaining visitors throughout the festive period. Blue Planet Aquarium’s Phil Jones said: “It was a great privilege to welcome Santa, the elves and the reindeer and we are all very much looking forward to their return on November 30th. “He has got an extremely busy schedule over the coming weeks so we were lucky to catch him when we did,” he added. Visitors to the aquarium will also be able to enjoy the antics of a sub-aquatic Santa over the Christmas holidays. He will be taking the plunge every weekend from Saturday, November 29th during the aquarium’s regular dive shows and will then be diving daily from December 20th – 24th.